As we know slowly We are going to Cashless Payment System. Cashless payment means we don’t need to carry cash in hand & can pay our expenses via digital money. And the government is also forcing to pay your payments via digital money using E-Payments, Debit and Credit cards, Net Banking and Digital wallet app. For making your digital payment easy there are many banks offer their own Digital wallet app. Such as ICICI Bank offers Pockets and SBI offers State Bank Buddy. But when it comes in popularity there are many third party Digital wallets apps available, in which first people use the PayTm app. PayTm is a major digital wallet app and most popular in India. With PayTm wallet you can do hassle free online expense/ shopping. You can Pay your Mobile, Datacard, Landline/Broadband, Electricity, DTH, Water, Gas, Metro, Insurance Bill. Along with this, you can book Bus Tickets, Hotels, Train Tickets, Amusement Parks, Events, Movie Tickets and Flight Tickets. And this is not limited to pay Bills and booking tickets only because PayTm also allows you to shop online and on small or Big shops. But before to use PayTm Wallet app, you need to activate (register) PayTm account and also need to add fund to it. So here I’ll tell you how to activate and add fund to wallet using credit/debit card. 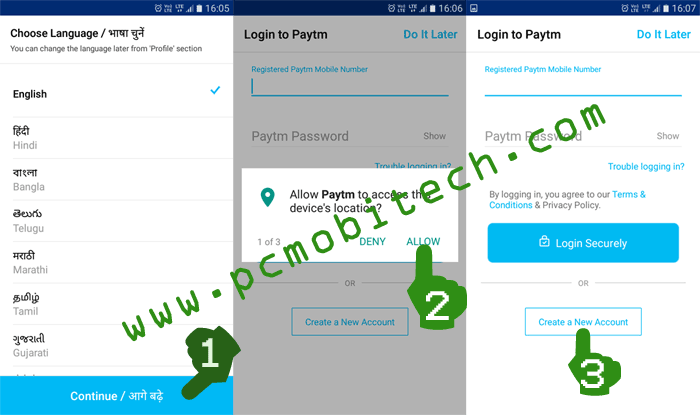 How to Add fund to PayTm Digital Wallet? If you have recently installed PayTm app and thinking to activate it but don’t know how to activate and register PayTm account and the app. Then follow the steps below to register and activate the PayTm app. Start PayTm app in your Android or iPhone, and Choose your preferred Language, then tap on Continue button. Next, tap Allow the 3 Permissions: Location, Manage Phone Calls, SMS permissions (if you don’t want to give permission, simply tap on Deny, but you will need to manually verify received OTP in Paytm app). Now, Login to Paytm page will appear. If you already have a Paytm account you can login by entering the mobile number and password. Incase you don’t have, then You will need to create a new account. To create a new Paytm account tap on the Create a New Account button. Mobile Number: Enter a working mobile number. And also You’ll need to verify this mobile number. So keep the phone in your hand because you’ll receive OTP on this number. 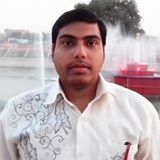 Please note one thing, use here only original mobile number because if you use Temporary Phone Number online service for the verification, then later you will come into the trouble because Paytm regularly sends billing and other information to this number, therefore use main mobile number instead of fake. Password: Create a good password including letters Small and capital (AbCDe), numbers (123456789) and special characters (*.#@%&) eg: My*WoRld123. And also write this password on a paper and keep it in the safe place. This will help you when you forget it. Email ID: Enter a working Email ID. This will help you to get important Updates of Paytm transaction and news. This is optional, if you would not like to share Email ID, leave it empty. After entering correct information, tap on the Create a New Account button. If the entered mobile number is correct, you will get an OTP message immediately on your number. If you have allowed the permission then it will automatically select the OTP, otherwise you will have to enter manually. After that tap on the Confirm button. Next, You’ll have to verify your ID because under new RBI rules you couldn’t use a Payment wallet with full strength (You can add the fund in to Paytm app) until you’ll not complete KYC. So if you want to add fund into the walled then it is must verify your identity with a document proof. If you don’t want to verify your ID now, tap on the DO it later top right link. Or for verification select any ID type and enter the ID number, tick the confirmation check box and tap on the Submit button. 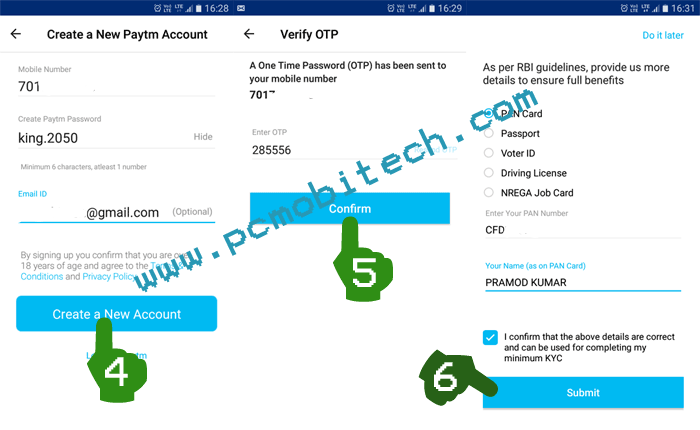 That’t it, Now you have successfully created a Paytm account and activated the Paytm Wallet app, you can start adding fund, if you have finished the KYC Form. 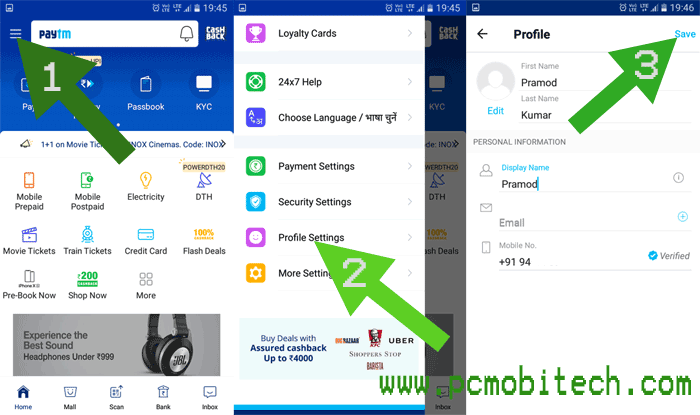 After activation of the Paytm wallet app, you should complete your Profile information. So tap on the top left menu button and choose Profile Settings option. In the Profile fill the Enter your First name, Last name, Display Name, Email (Optional) and then tap on top right Save Button. And you will see “Your Profile information has been updated successfully.” message. If your KYC has been completed, you’ll start seeing an Add Money Icon at Home screen of the App. If it is available then tap on this. On Next screen, you’ll have to enter the Amount that you want to add into the walled. And tap on the Add Money button. Important message box will appear, tick the check box I understand and tap on Confirm button. Card No: Enter your Debit card number available on front side. Month & Year: Select your Card Expiry month & year. CVV: Enter here 3 digit CVV code which prints on back of card. Save this card for future checkout: check this check box if you want to save this card in PayTm app for faster payments. Pay now: Tap on the Pay now button to make Payment to Paytm Wallet. Now wait for few moments and the page will be redirected to your bank card verification page. On Bank card verification page you’ll need to enter OTP (One Time Password), which will be sent by Bank to your registered mobile number. So check SMS OTP (message) on your bank registered mobile number and fill 6 digit OTP code in PayTM app. In case you have enabled 3D secure PIN on your card then you’ll see your Bank 3D secure PIN password verification page and you need to enter 3 Secure PIN. After filling OTP or 3D secure PIN tap on Submit button. After submission, the page will be redirected to PayTm Order Summary page and you’ll see success message of Rs. 1 PayTM cash. And also will receive a debit card transaction SMS on your Registered mobile number and a transaction email from PayTm. And the card will be saved into PayTm for future transactions. You have been successfully added Rs. 1 fund to your PayTm wallet. And now when you need to add more fund then on PayTm home screen tap on Add Money option>> Fill necessary amount and tap on Add Money button. And follow the same steps as above described. Any type of problem-related to the topic. Leave a reply. How to activate Avast Anti-Theft android app? I am not able to add money in paytm through debit card after kyc verification and 100 mobile recharge.pl tell the procedure. If you already signed up previously, then you don’t need to signup again. Just use Forgot Password link. while activating paytm wallet its getting- you have exceeded maximum number of verification..try after 24 hours..since yday..what can i do now? My Paytm app is not activating. What error you’re getting? If Paytm service is already activated previously then you will need to reset it or you can use Forgot password option. No, They don’t provide any offer when you add money to Paytm. When you go to add money to PayTm Wallet, PayTm will not ask any OTP confirmation. It may be bank which want to confirm that it is doing by account holder. So first check your Bank Registered mobile number. And if it is asked by Paytm then double check your Paytm registered mobile number.